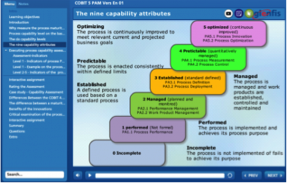 Our complementary eLearning modules COBIT 5 are based on the current status of didactics, pedagogy and ergonomics. The advantages of these modern learning methods can be summarised in 3 words: anywhere, anytime and flexible. Learning Time: For working through this module you will need between 80-90 minutes.